Empty both cocoa packets into a mug. Add 1 cup very hot water, and mix until powder has dissolved. Add 2 tsp. caramel dip, and stir until it melts into the hot cocoa. Place the remaining tsp. caramel dip in a small microwave-safe dish, and heat for 10 seconds. Stir until smooth and pourable. Then top cocoa with Reddi-wip and drizzle the caramel on top. Sprinkle the whole thing evenly with the salt and Splenda. Enjoy! We love, LOVE the idea of salted caramel anything. We are all about decadent, fun flavor combos that involve chocolate and sugary goo, but the nutritionals on this cocoa from The 'Bucks are pretty shocking. A reasonably sized "Tall" with whipped cream has close to half a thousand calories -- and almost as much fat as TWO Krispy Kreme Original Glazed Doughnuts! (The doughnut duo actually has FEWER calories than the cocoa.) Even a "Short" with NO whip will cost you 270 calories and 10g fat! However, we've received SO many emails (47!) 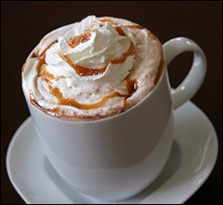 about the Salted Caramel Signature Hot Chocolate at Starbucks, we HAD to find a way to make a guilt-free version. So we did. And the good news is, OURS is available all year round. (The S-bux version is seasonal and may actually be gone forever!) Our confection-in-a-cup makeover has SO much less fat and WAY fewer calories. It's also ridiculously rich and creamy. So get busy stirring up some delicious hot stuff in your kitchen, people. Sometimes when you want something done right, you've got to do it yourself. Today, March 3rd, is National Mulled Wine Day. 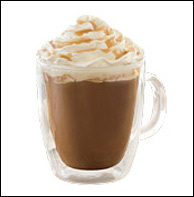 We're going to skip the celebration and snuggle up with another warm beverage, our Sweet 'n Salty Caramel Cocoa. Chocolate brings people together! Click "send to a friend" and share the love with loved ones through the power of cocoa.